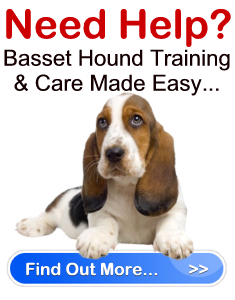 Basset Hound Puppy Care Tips " "
Congratulations! You’ve decided to bring home your very own Basset Hound puppy. However, do you have everything in order? Do you have food, treats, toys, leash, collar, and a bed/crate ready? What about a Veterinarian? Have you picked one for your pooch? You need to choose a vet before you bring home your dog. You don’t want to begin your search for a vet when the time comes that your pup needs a checkup. The reason is because it is important that both you and your Basset Hound puppy are comfortable with the vet, and the vet is comfortable with your dog breed, before you actually require his/her services. Furthermore, finding the right vet may not be as easy as you think. For instance, just because there may be a vet located down the street, doesn’t mean that this person is the right choice for your dog. You need to think of finding a vet for your pup as the same as finding a doctor for yourself. You want someone who will talk to you with understanding and respect; you don’t want to be talked down to or spoken to in medical jargon you don’t understand. You need a vet who will answer your questions and not rush you along to attend to the next patient. A vet also needs to be trusted and liked by your dog. You’re looking for vet to be there for the rest of your dog’s life. It’s also essential to your budget that you find a vet who has an on-site lab where they work. If your vet needs to send lab work out, this is going to cost you extra money and create a delay in test results. Therefore, you need to compare the costs between different vets that could potentially be a good choice for your Basset Hound puppy. However, just remember that cost shouldn’t take priority over the health and care of your dog. Don’t be afraid to question costs and find out the reasons why a vet may charge a higher or lower price for the same procedure. It’s a good idea to find a vet you are comfortable with prior to obtaining your dog, and then schedule a non-medical visit with the vet to introduce your Basset Hound puppy to your vet and the environment to create a positive experience. Don’t forget to ask local friends and family members for vet recommendations if they own dogs.